Home 2018 October 21 NFL Minnesota Vikings at New York Jets – 10/21/18 NFL Pick, Odds, Prediction and Online Live Stream in HD. 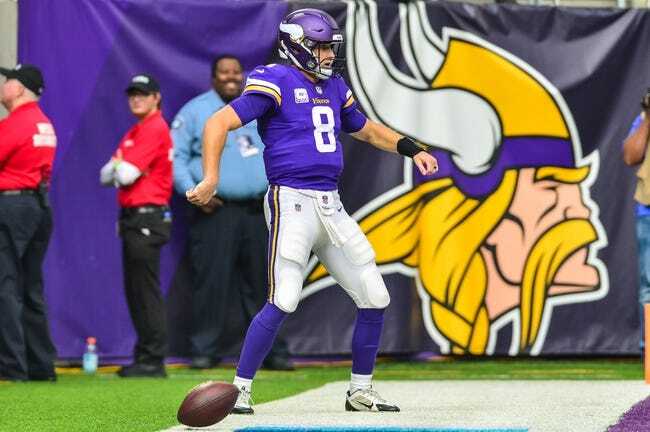 Minnesota Vikings at New York Jets – 10/21/18 NFL Pick, Odds, Prediction and Online Live Stream in HD. Live Stream: Click Here To Watch Live in HD. The Minnesota Vikings and the New York Jets meet in week 7 NFL action from MetLife Stadium on Sunday afternoon. The Minnesota Vikings will look to build on back-to-back wins after a 27-17 win over Arizona last time out. Kirk Cousins has thrown for 1,921 yards, 12 touchdowns and 3 interceptions while Latavius Murray has rushed for 261 yards this season. Adam Thielen leads the Vikings with 58 catches for 712 yards and 4 touchdowns while Stefon Diggs has 40 grabs for 435 yards and 3 touchdowns this season. Defensively, Danielle Hunter is tied for the league lead with 7 sacks while Harrison Smith has an interception, 3 sacks and a team-high 25 tackles. As a team, Minnesota is averaging 391.2 yards of total offense per game, including the 7th-most passing yards with 303.8 per contest and 23.3 points per game this season. The New York Jets will be looking to build on back-to-back wins following a 42-34 win over Indianapolis in their last outing. Sam Darnold has thrown for 1,346 yards, 9 touchdowns and 7 interceptions while Isaiah Crowell has a Jets-high 430 rushing yards and 5 TDs this season. Quincy Enunwa leads the Jets with 22 catches for 287 yards while Robby Anderson has 270 yards and 3 touchdowns this season. Defensively, Leonard Williams has 3 sacks while Avery Williamson has a pair of sacks and 32 tackles this season. As a team, New York is averaging 340.5 yards of total offense, including the 7th-most rushing yards per game with 130.3 yards per game to go along with 27.5 points per game this season. Minnesota is 7-3 ATS in their last 10 road games and 45-21-1 ATS in their last 67 games overall while the over is 4-1 in their last 5 games following a win. New York is 10-2 ATS in their last 12 home games and 8-0-1 ATS in their last 9 games in October while the under is 5-1 in their last 6 games following a win. Minnesota is 1-4 ATS in the last 5 meetings between these two teams. I’m never the guy to back the Jets, as they just are too inconsistent to blindly back. However, New York has been almost money at home dating back to last season ATS, and while Minnesota is a solid team and is the better team in this matchup, I can’t shake that loss to the Bills from a few weeks ago from my memory. The Vikings haven’t been the same dominant team that we saw last season, and I think the Jets are finding some new confidence now that they’re able to put points on the board, so I’ll take a shot with the free points and the Jets here.